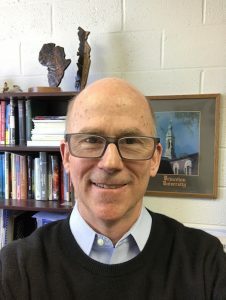 Chris Mullen is an associate professor in the Department of Civil Engineering at the University of Mississippi where he served three years as interim department chair. He earned his Ph.D. at Princeton University, master’s of civil engineering at Rice University, preceptorship at the National Institute of Standards and Technology and bachelor’s of civil engineering at Rice. Before earning his Ph.D., Mullen worked five years at Mobil Research and Development Corp. in the Offshore Engineering Division — two years of which were spent with Mobil Exploration and Producing Southeast Morgan City field office. He then joined the consulting firm ADAPCO Inc. as an FE analyst and later WAI as a bridge engineer. Mullen has served UM for over 20 years, conducting research projects for the U.S. Department of Energy, the Department of Transportation, Department of Homeland Security (Science and Technology and FEMA), the Mississippi Emergency Management Agency and the Mississippi Department of Transportation; publishing widely in archival journals and conference proceedings; and engaging in professional service through consulting in bridge collapse investigations, appointment on the state Earthquake Advisory Council and peer review of state Mitigation Plan updates and hurricane mitigation insurance incentives. He has advised numerous doctoral and master’s students and upperclassmen, and taught courses on engineering and structural mechanics, steel design, pre-stressed concrete design, civil engineering design, finite element analysis, multihazard analysis and design, and response of structures to extreme loading. He has served the state in a variety of outreach capacities, co-founding the UM Center for Community Earthquake Preparedness and co-writing the first earthquake component of the state and UM campus Mitigation Plans. He served in the emergency operations center during Hurricanes Dennis and Katrina then as Mississippi representative on the FEMA Mitigation Assessment Team. He joined the American Society of Civil Engineers in 1978 and has served as chair of the SEI Methods of Analysis technical committee, associate editor for the Journal of Structural Engineering and as a member of the EMI Objective Resilience technical committee. He has been a member of the NIBS Multihazard Mitigation Council and the Earthquake Engineering Research Institute. He recently participated in offering the first EMI Objective Resilience Short Course at Tongji University.